106 pages, 5.5" x 8.5"
Tactical Medicine is a detailed crash course in the administration of emergency care under the most life-threatening conditions. Packed with invaluable information and insights from a veteran tactical medic, this book is an excellent introduction to providing critical medical care when lives hang in the balance – both yours and your patient's. You will learn the three stages of tactical medicine, the vital priorities of administering care under fire, the realities of setting up an efficient triage system, the must-have equipment and supplies for a tactical medicine kit and the best methods for transporting your gear while on the scene. 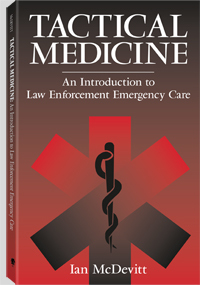 Whether you are a medic assigned to a SWAT team or military unit, an EMT thinking of entering law enforcement or a student who is interested in this dynamic field of medicine, this book is a fantastic reference. Ian McDevitt is a former U.S. Army Airborne infantry officer (Reserves) who currently works for a hospital-based paramedic service in northeastern Connecticut. He is a graduate of several advanced tactical and wilderness medical schools and has been a street paramedic for 12 years.